Maximize your key control system with user-friendly KeyPro key logging and management software. 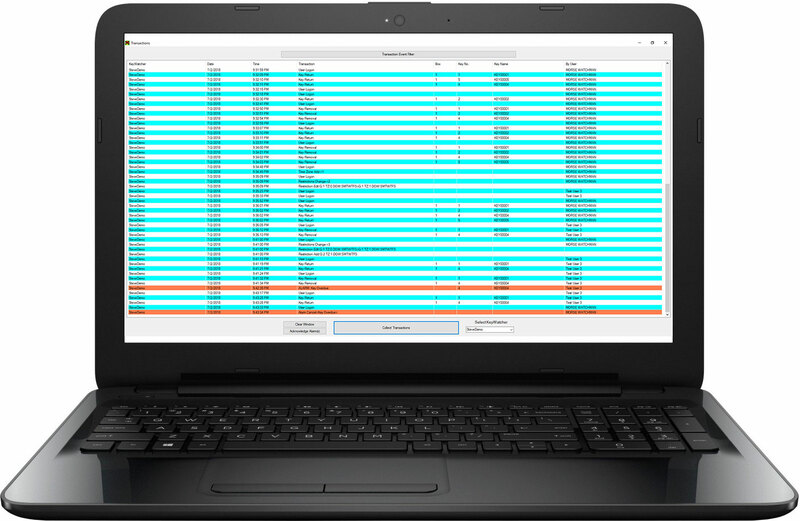 A PC application with remote access capabilities, KeyPro lets system managers establish permission levels for each User Code and monitor data from any desktop connected to the network. The key logging and tracking software can run activity reports, sort based on different criteria, view and print reports, and more. System managers can generate practical management reports, which trace key movements by time, date and user code. An audit trail report indicates the time and date of every key accessed by a user for a given time parameter. A built-in scheduler automatically downloads all data to a secure PC, allowing system managers to sort and analyze information to maintain maximum control of access and security issues. KeyBank now offers the capability to send priority email alerts to security managers, keeping them informed of the whereabouts of Smart Keys. Real-time Transaction Polling – A built-in scheduler automatically downloads all KeyBank data to centralized or remote computers. Maximized Network Capabilities – With KeyPro III’s networking capabilities, sensitive database files can be kept on a network server. This also allows for any installation of KeyPro III to have the ability to make changes and synchronize the data with the KeyBank system. Local Area Network Access – Accessibility to the key management systems over a LAN enables managers to perform functions on any KeyBank via TCP/IP. Another key feature of the software is the built-in scheduler. This tool automatically downloads all data to a secure PC, allowing system managers to sort and analyze the information so they maintain maximum control of access and security issues. When combined with the Key Pro III software, no other similar product on the market is as technically advanced as the KeyBank and KeyWatcher by Morse Watchmans. With Key Reservations, authorized users can even reserve a key in the system for a specified time frame. For added security, the KeyBank® system can be integrated with a Magnetic or Proximity Reader.